US stocks moved mostly higher during the trading day on Wednesday, extending the strong upward move seen on the previous session. The Dow jumped 241 points to 25,115 climbing further off the multi-months low set on Monday. Looking ahead, a slew of economic data is scheduled to be released today, including reports on weekly jobless claims, labor productivity, and construction spending. However, trading activity may be somewhat slow as traders look ahead to the release of the monthly jobs report tomorrow. 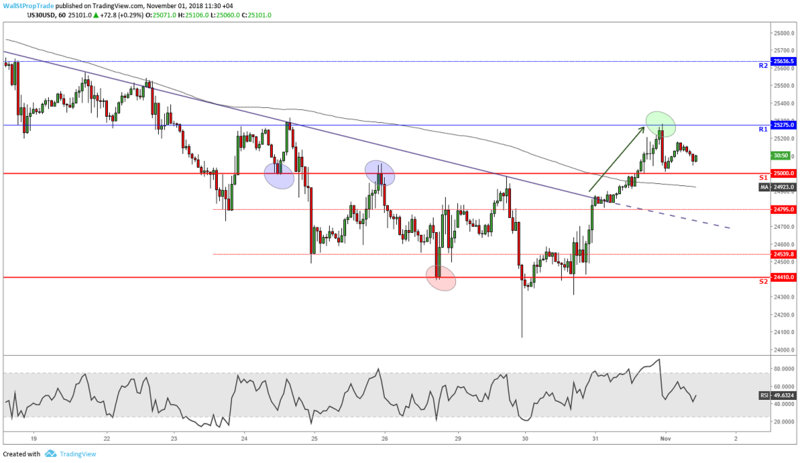 The Dow pushed through key technical resistance and psychological levels yesterday at 25,000 but failed to close above the 200-Day Moving Average ending the day indecisive. One bearish candlestick pattern matches today's price action, the Bearish Hikkake Pattern. However, the 25,000 resistance is now likely to act as support going forward. The RSI looks mixed not giving us any clear signal either.